I’ve never been happy with gift-giving for Christmas. I don’t like the idea that the only way to show that you care is to spend money, usually on something that the other person doesn’t need. Too many times, the recipient doesn’t even like the gift I’ve given and tells me so. There are so many people who are really in need. Now I give to charity instead. This year I went to an Alternate Giving Fair held in a local church. The event was very well organized. There were tables set up for different charities with signs telling what a certain amount of money would buy and knowledgeable staff to answer questions. The atmosphere was very soft sell. After making my choices, I bought cards with notes about my charitable contributions, and I had them inscribed by calligraphers. I was also the recipient of such a “gift” this year. One of my friends is going with a group from her church to rebuild some areas severely damaged by Hurricane Katrina in New Orleans. She sent me a card about the work she will do. She is very excited about it, and I am, too. She has a handicap herself, and she has trouble getting around and doing some things that most of us take for granted. It’s a personal triumph for her find ways to do what she wants to do – in this case, helping others. I did it! I started keeping a practice log. For a long time, I didn’t because I was afraid I’d feel bad because I don’t practice enough. I’ve found that the reverse is true. I give myself more credit for doing things when I’ve written them down. What is practicing? If I play music just because I like it, does that count? Must I suffer to earn credit? What about goals? I’m not a professional musician and I’m not taking lessons, so I don’t have exams, auditions, or lessons to prepare for. I do prepare for orchestra rehearsals and gigs, and I work on tunes for jamming. What about the days when I spend several hours playing with other people, either rehearsing with written music or jamming without it? I don’t think of this kind of playing as practice, but I do learn by playing with others. In fact, the only way to get good and stay good at jamming and improvising is to do these things frequently. I’m finding that the greatest benefit of keeping a log is that I set goals for myself and monitor my progress. I’m doing for myself what I do for my students. I write down the exercises, etudes, and pieces that I work on each day, and I write notes like “needs more work” or “try … next.” This gives me focus. The written log also helps me keep a balance. I see what I’ve been doing a lot of and jolt myself into doing a greater variety of things. Should I put a smiley face sticker in my log book when I’m pleased with something I’ve done? The holiday season is a time of strong emotions – love and hope, disappointment and anger. Do you ever feel battered and weak? ”Who will start bidding for me? A dollar, a dollar” - then “Two! Only two? As sweet as a caroling angel sings. ”A thousand dollars, and who'll make it two? He's going and almost gone. Happy holidays to all my friends at v.com! Here is my holiday greeting card for everyone at v.com. The week before last was orchestra-intense. We had rehearsals Monday, Wednesday, Thursday, and Saturday, and our concert, our annual Messiah singalong, was Sunday. I was excited all week. I really enjoy making music with this group of people, and I love the Messiah, with all its verbal and musical drama. I know that after the concert, we have about six weeks before we resume rehearsals, and I go into withdrawal. This knowledge made the excitement even more intense. It’s always fun to rehearse and then play with the chorus and soloists. This music is really incomplete without them. Initially, our conductor sang many of the soloists’ parts during rehearsals, and he was very, very good. I almost felt that he could replace them, but, of course, I was wrong. We were very fortunate to have such excellent soloists, especially the soprano, who comes to us from the Met. She is inspiring both musically and personally. After years of training and auditioning, she finally made it into the Met in 2000. After 9/11, the Met was hard hit by cutbacks, and she had to take an office job in addition to her singing job. Then she had serious problems with her health and had to leave the Met. Last year, when I first heard her sing “I know that my redeemer liveth,” I could hear the faith in her voice. I asked her about it, and she confirmed that she really did believe it. At rehearsal this year, she moved me to tears with a very short and seemingly simple solo. We exchanged contact information so that we can stay in touch. I was happy to see the tenor soloist at rehearsal, too. Last year he was nearly incapacitated by severe pain from a back injury, and, during the concert intermission, I saw him leaning against the wall, wracked with pain. He slipped away quickly as soon as the concert ended, before I could talk to him. This year, as soon as I saw him, he rushed to talk to him and ask him about his health. He told me about his struggle with his back pain, including a serious exercise regimen, and his ability to function well again. Recovery of body and spirit are miraculous. I always send out “concert alerts” by email to my students and some of my friends, not expecting much, and knowing that I’ll feel happy if anyone shows up. This year three of my students and their families, as well as one of my friends, came, and I could not have been more happy if I had had real groupies. The concert went very well. We got a great response from the audience in the form of heavy applause after each number and substantial singing along. The female soloists sat onstage just to my right during the concert, and they sang along with the chorus, so I had an extra, semiprivate performance to enjoy. There were, of course, minor glitches. The principal second violinist noticed someone playing badly out of tune during one of the recitatives and realized, to his chagrin, that he was the one. His D string had slipped loose by about three half tones. He managed to avoid playing his D string until the end of the selection, when he retuned quickly and quietly. At another time, I turned two pages instead of one. I saw the tenor moving to the front of the orchestra for his solo, and I thought, “That’s strange. Last year this was a soprano solo.” Duh. I found the correct page quickly. We always have a reception following the concert, and it’s my favorite holiday party. All the performers, as well as their friends and family who attend, share in the celebration. This year we almost didn’t have a reception because the reception room was double booked. I thought of the Grinch Who Stole Christmas and wondered whether we would have to spread blankets out on the lawn and eat fried chicken from a fast food place while dressed in our formal concert attire. Fortunately, we got a room in an adjacent building and we had our party. My friend in the audience is in a wheelchair, and I hoped that she would be able to park her car and get into the concert hall without mishap. She did. Getting to the reception was another challenge for her, but our conductor came up with a key to the freight elevator and escorted her personally. Another year. Another Messiah. Another series of miracles. I wish you all happy holidays and your own personal miracles in the new year. I have a new friend who is a very good, self taught folk musician. 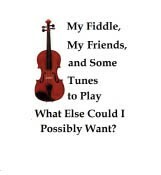 Although he doesn’t play fiddle, he relates to it well because he plays mandolin, which is tuned and fingered the same way. We’ve been having fun jamming together. The other day, he disappeared discreetly into a back room while I gave a lesson. My student is a talented young girl who plays so well that I really enjoy listening to her. She is working her way through Wohlfahrt, which she and I both dislike, but it’s good for you. I told her that she might actually like one particular exercise because it sounds good. It has some arpeggios that progress in a reasonable way from one key to another. She sight read it and played it quite well. Our lesson included both classical and folk music, and she sounded very good on everything. After she left, my friend came out of hiding and said, “She is really good! How many years has she been playing? I especially liked the way she played that piece with the runs in D major. I felt like getting out my mandolin and playing with her.” That was Wohlfahrt. “I’m impressed that you could tell that it’s in D major,” I told him. “That wasn’t hard to figure out,” he replied. “I recognized the open strings.” He had been in a room where he could hear her fairly well but couldn’t see her at all. What talent! I can’t stand it.